First off, don't forget that tomorrow's Confessional Friday topic is "A Day in the Life". Link up and share with us what it's like to spend a typical day in your shoes! Remember Monday when I said that I'd been craving all things spicy and salty with Ainsley? 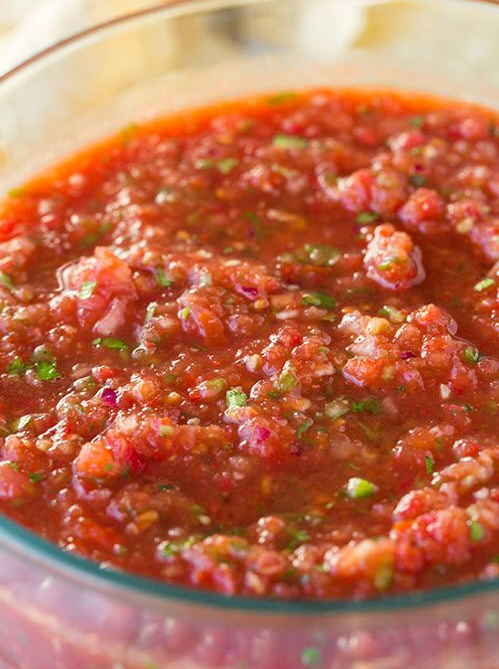 Well, one of those food items is salsa: peppery, tomato-y, lime-y salsa. Frankly, I'm not a fan of salsa out of the jar - blech. It doesn't pack the flavor punch like the homemade stuff at some of my favorite Mexican restaurants. But what chica in her right mind wants to drive down the street (or across town, if you live in a spread-out area like we do), to the nearest Mexican eatery every time she wants a bowl of fresh, cold salsa? Not my photo by a landslide. Mine was not this pretty. This one comes from Cooking Classy - a fantastic cooking blog. So, I made my own by combining about three different recipes and substituting my own measurements of the ingredients to perfect it to my liking. I'm pretty proud of how it turned out, but don't take my word for it. Grab yourself some veggies, spices and a food processor and get 'ta blending! Warning: This stuff packs a little heat. Not so hot that you can't eat it, but I do like spice. If you're a weenie person with a more sensitive palate, use only one serrano pepper instead of two. 1. Combine chopped peppers, onion, cilantro, lime juice, lemon juice and garlic powder in a food processor and pulse for 8-10 seconds. 2. Add in chopped tomatoes a little at time, pulsing twice or three times each time you add some in. You don't want to over-process your ingredients, but you do want to make sure they're blended nicely. 3. Lastly, add in your sea salt a bit at a time, stopping the food processor every few seconds to taste. Make it as salty (or not) as you like. 4. Chill in fridge for a minimum of one hour. 5. Get a bag of chips and your salsa -- we prefer the On the Border Cantina chips since they're thin and crispy like the restaurant variety -- kick off your shoes, crack open an ice cold Coke (or a cerveza, if you are not with child), and throw a party for your tastebuds. oh my gosh i could live off chips and salsa - this looks amazing!! This sounds amazing! I love salsa, but some stuff just doesn't cut it. This one Mexican restaurant near my house serves salsa that tastes like tomato soup. No lie. It's gross. I want this right now. Then again, I could eat salsa constantly. But still. YUM. I made this today! It was amazing. Thanks for sharing.